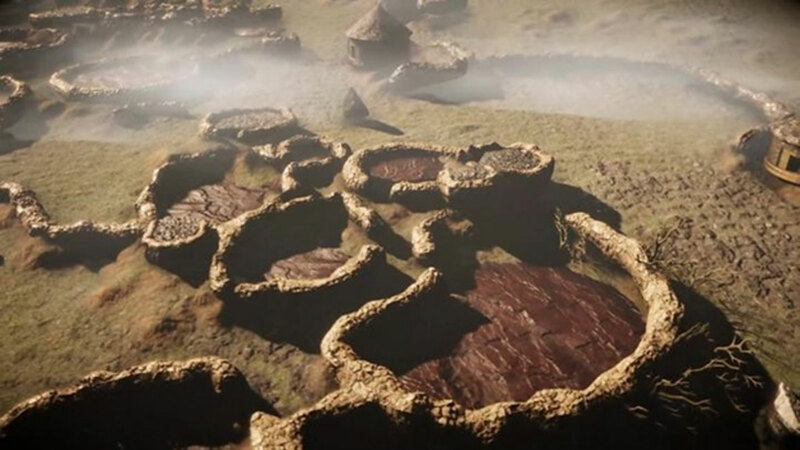 Now the same technology which located those Mayan cities has been used to rediscover a southern African city that was occupied from the 15th century until about 200 years ago. This technology, called LiDAR, was used to “redraw” the remains of the city along the lower western slopes of the Suikerbosrand hills near Johannesburg. It is one of several large settlements occupied by Tswana-speakers that dotted the northern parts of South Africa for generations before the first European travelers encountered them in the early years of the nineteenth century. In the 1820s all these Tswana city states collapsed in what became known as the Difeqane civil wars . Some had never been documented in writing and their oral histories had gone unrecorded. Four or five decades ago, several ancient Tswana ruins in and around the Suikerbosrand hills, about 60 kilometers (about 37 miles) south of Johannesburg, had been excavated by archaeologists from the University of the Witwatersrand. But from ground level and on aerial photos the full extent of this settlement could not be appreciated because vegetation hides many of the ruins. The city was given a generic placeholder name – SKBR - until an appropriate Tswana name was adopted. Now the lost city is known as Kweneng. Judging by the dated architectural styles that were common at Kweneng, it’s estimated that the builders of the stone walled structures occupied this area from the fifteenth century AD until the second half of the 1800s. The evidence we gathered suggests that Kweneng was certainly large enough to be called a city. The ancient Mesopotamian city of Ur was less than 2km in diameter while Kweneng is nearly 10km long and about 2km wide. It is difficult to estimate the size of its population. Between 750 and 850 homesteads have been counted at Kweneng, but it’s hard to tell how many of these were inhabited at the same time, so we cannot easily estimate the city’s population at its peak. Many features of the built environment at Kweneng seem to signal the wealth and status of the homesteads or suburbs that they are associated with. For example, parallel pairs of rock alignments mark sections of passageways in several different parts of the city. If these were cattle drives the width and location of these passageways would have signaled the livestock wealth of the ward or homestead that constructed them, even when the cattle were not present. In the central sector of SKBR there are two very large stone walled enclosures, with a combined area of just under 10, 000 square meters (12,000 square yards). They may have been kraals and if so, they could have held nearly a thousand head of cattle. Among the largest features of the built environment at Kweneng are artificial mounds composed of masses of ash from cattle dung fires, mixed with bones of livestock and broken pottery vessels. All this material appears to have been deliberately piled up at the entrance to the larger homesteads. These are the remains of feasts and the ash heaps’ size publicized the particular homestead’s generosity and wealth. The use of refuse dumps as landmarks of wealth and power is known from other parts of the world , like India, as well. Even the contemporary gold mine dumps of Johannesburg can be seen in this light. Other monuments to wealth and power at KWENENG include a large number of short and squat stone towers – on average 1.8 - 2.5 meters tall (2 - 2.7 yards) and about 5 meters (5.5 yards) wide at their base. The homesteads with the most stone towers tend to also have unusually large ash heaps at their entrance. The practical function of the towers isn’t known yet, they may have been the bases for grain bins, or they may mark burials of important people. It will take another decade or two of field work to fully understand the birth, development, and ultimate demise of this African city. This will be done through additional coverage with LiDAR, intensive ground surveys, as well as excavations in selected localities. Top image: Lost Ancient Tswana City called Kweneng near Johannesburg. Source: Kgosi Kai / CC BY-SA 4.0 . This article was originally published under the title ‘ How we recreated a lost African city with laser technology’ by Karim Sadr on The Conversation , and has been republished under a Creative Commons License.